You can't please all of the people all of the time, Abraham Lincoln once said — but Clavia aim to prove him wrong with their new Nord Electro 3 keyboard. 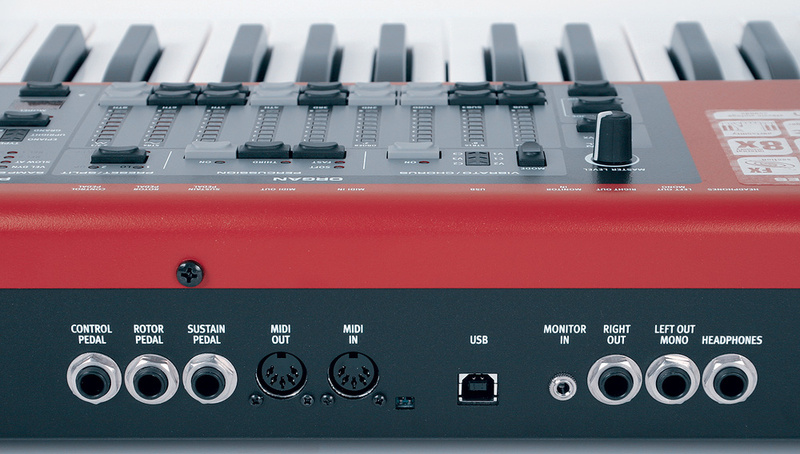 The Nord Electro 3 is the latest addition to Clavia's virtual electromechanical range. From the outset, acoustic pianos were allowed to mingle with their electronic brethren, so further conceptual anomalies are to be expected. In the Electro 3, modelled organs and velocity‑layered pianos are joined by strings, flutes, choirs and other 'real instrument' samples harvested from an extensive and growing on‑line library. In common with the Nord Wave, any sample can be ousted and replaced, ensuring that the Electro 3 ticks as many boxes as possible. 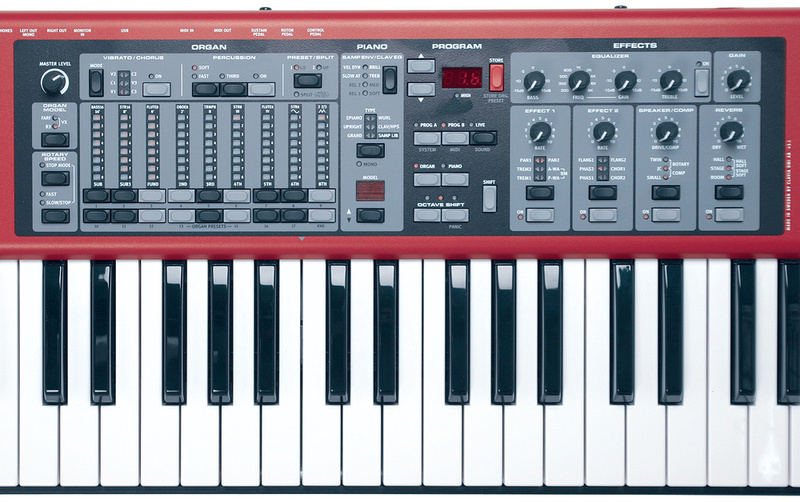 The original Nord Electro received its SOS outing in December 2001, and it is testament to Clavia's commitment to getting it right that subsequent software upgrades and two hardware revisions followed. The latest of these is available in two models — the 73‑note (reviewed here) and the 61‑note. Both feature the same semi‑weighted, slightly springy keys, ideal for speedy organ fingers and an acceptable compromise for electric pianos. The keyboard response defaults to 'Fast' for organ models, which means that notes are triggered at the top of the key's travel. It would be a tall order to produce a keyboard perfect for both organ and piano technique, though; if you gravitate towards piano, check out the (more expensive) Nord Stage EX. The Electro 3's lineage can be traced through earlier instruments such as the Electros 1 and 2, the C1 and the Stage. For a refresher on the technology employed, I recommend consulting the February 2006 and April 2008 issues of SOS, for the Nord Stage (/sos/feb06/articles/clavia88.htm) and Nord C1 Combo (/sos/apr08/articles/clavianordc1.htm) reviews. Despite its digital nature, the Electro 3 firmly embraces old-school values. Its three‑character display is perfectly adequate — evidently so, because I didn't need the manual once. Even the slightly cryptic 'deeper' Sound and MIDI parameters are printed on the front panel — a simplifying step too far for my taste, likewise the sticker listing new features. I'm probably showing my age (again), but I reckon this is the aesthetic equivalent of fingernails on a blackboard. Fortunately, that was the only blip on my Moaning Old Git radar. 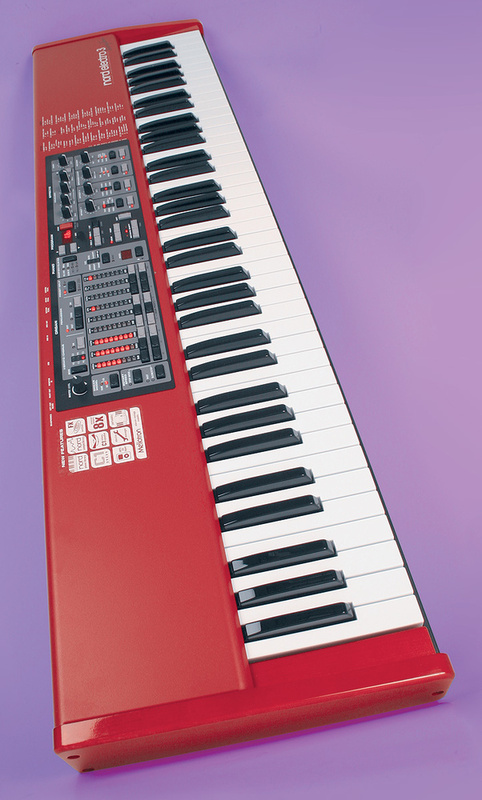 In fact, I found the Electro 3 a vision of crimson beauty, from its LED drawbars to its red‑lacquered end cheeks. Construction is as unflinchingly robust as we expect from the Nord line, yet, thankfully, portability isn't compromised. At 9kg (7.6kg for the five‑octave version), this is one collection of classic keyboards that shouldn't leave you in need of surgical support. There are just two audio outputs configurable in several different modes, the default being 'normal stereo'. The additional modes include one in which piano patches (and effects) are routed exclusively to the right output, with organs (and their effects) to the left. That's fine as far as it goes, but it obviously compromises stereo pianos or other stereo samples. For the individual processing requirements of the various instrument types, the onboard effects and EQ aren't bad; they include a serviceable reverb and the impressive rotary speaker simulation we've seen before, meaning that you might not need much external processing. But I don't think one additional output would have been much to ask for. Other than paucity of outputs (and a missing MIDI Thru socket), there isn't much evidence of skimping. The rear panel has the expected inputs for sustain, control and rotary speaker pedals. There's also a mini‑jack input that directs any stereo source into the Electro 3's headphone mix. This signal never reaches the main audio output or the effects section; the feature is intended to eliminate the requirement for a mixer during practice sessions with an iPod or other backing material. Finally, a USB interface is present for data transfer and OS updates. The rear panel features the expected audio, MIDI and control‑pedal sockets. Less expected is the addition of a 3.5mm input for external sound sources, routed directly to the headphone output. The Electro 3's three organ models were much admired on the C1 Combo. Based on the Hammond B3, Vox Continental and Farfisa, all are fully polyphonic and employ nine digitally controlled drawbars, with buttons and LED bar-graphs rather than physical drawbars. It's a workable system, not least because of the visual feedback received each time a fresh patch is loaded from memory. As each drawbar button sends and receives MIDI continuous controllers, I couldn't resist a little automation of these via a sequencer, cranking up the tempo for a visually dramatic LED‑fest to accompany the manic tonal changes. We've analysed these organs in depth previously, so it's enough for me to repeat that all three models sound very authentic, from the brash and gnarly Vox to the often cheesy Farfisa. The Hammond B3 emulation became my instant favourite; its percussion is bitingly effective, with a choice of either normal or softened levels, fast or slow decays. The 'Third' button switches its percussion effect to use the third partial, and you can even transcend a B3 restriction in which the ninth drawbar is cancelled whenever percussion is activated, choosing either faithful reproduction or both at once. Thanks to the Shift key, the drawbar up/down buttons are also home to 17 organ presets, plus an 'RND' option to generate random drawbar settings. These presets store drawbar values for each organ type, as well as settings for vibrato/chorus, percussion and keyboard split. Keyboard split is, sadly, an organ‑only option, although you can specify where on the keyboard the split should occur. If you possess a spare controller keyboard, I recommend trying 'MIDI Split'. Activate this mode and an external MIDI keyboard plays the lower organ part via a separate MIDI channel. Those of us weaned on dual-manual organs will instantly feel at home — although I'd have preferred the choice of whether the upper or lower keyboard could be MIDI controlled. Only one organ model can be active at once, so you can't combine a Vox lower manual with a Hammond upper, in case you were wondering. Every organ patch stored into one of the 128 available memories contains both upper and lower registrations. Even if you don't care for the split keyboard functionality, this is a nifty way to toggle quickly between two related tones. The organ's vibrato and chorus options are suitably tailored for each model; I've never been a great advocate of the Farfisa sound, for example, but its vibrato definitely brought back memories — with more than a hint of gorgonzola. To recreate organs of grit and nastiness, the Sound Menu's Tonewheel Mode offers user-adjustable tonewheel crosstalk, from clean right up to utterly grimy. This ability to dictate personal preferences is one of the great strengths of the Electro 3; further options include tweaking of percussion decay time and level plus key-click level. None of these menu items is continuously variable — there are often just three possible values available — but nevertheless this opens up key modelling parameters that so often are indelibly hard‑coded. Of the 256MB of onboard flash memory, 185MB is permanently allocated to pianos. This might not seem a huge figure when compared to purely software instruments but there's room for multiple acoustic grands, a Yamaha CP80, an upright piano, several electric pianos, Clavinet and harpsichord. Every one can be replaced by others from the Nord Piano library, some of which are surprisingly small in terms of memory. The Yamaha CP80 is a fraction over 5MB, yet it sounds excellent, proving the old adage that size isn't everything! Pianos are selected by type and by number — it's up to you to remember whether grand piano number one is a Yamaha or a Steinway, or whether you decided on French or Italian harpsichords. Running through the factory sounds, I found electric pianos, harpsichords and, especially, Clavinets all responded well to the springy keyboard action. With additional controls to mimic the dual pickups and EQ variations of the Clavinet D6, the Electro 3 breathed more realism into Clavinets than ever before. However, when I began to play the acoustic pianos, I was initially underwhelmed. I investigated some alternatives (thoughtfully supplied on DVD) and even though some of these grossed 60MB (due to their extra velocity layers), I didn't find quite the responsiveness I was hoping for. If, at this point, I hadn't had a Nord Stage EX waiting in the wings, I might have dismissed Clavia's acoustic grands as being lacklustre; devoid of upper-end sparkle. Instead, I played them from the Stage's weighted piano‑action keyboard and felt far more satisfied. I eventually became content that the various electromechanical keyboards handled just fine, and that was probably of higher priority than delivering an optimum acoustic piano. Still, I'm sure improvements could be made if there were only some means of adjusting the Electro 3's keyboard velocity curve to suit personal taste. The remaining sample RAM (about 68MB) can contain up to 50 samples from that other Clavia resource, the Nord Sample library. This contains the kind of material keyboard players typically want, and as many entries are only around 4MB, the RAM stretches quite a long way. However, the keyboard is shipped with its memory almost completely full, so you'll need to clear the decks before auditioning potential alternatives. The samples supplied include some of the Mellotrons that so impressed on the Nord Wave, plus a gorgeous church organ, solo and ensemble strings, brass and lots more. Incorporating samples makes the Electro 3 a far more complete and rounded instrument; even if the organ‑playing demographic don't care for extensive sample swapping, the ability to do it is very welcome. Samples are selected by number and played back without a great deal of fuss or interaction. You won't find the controls for envelopes and filtering that are the Nord Wave's forté, but there are a number of different release times available, plus a slow attack setting and a switch to enable velocity control. In context, the choices are good ones. For both pianos and samples, polyphony is quoted at between 40 and 60 notes, depending on whether stereo or mono samples are used. The Electro 3's controls are all laid out clearly in the centre of the keyboard's front panel. As with some of its Nord predecessors, it has a 'button and LED' system in place of actual drawbars. There are four separate effects in a fixed signal path, each with an algorithm selector and a single parameter to adjust. With an EQ and a programmable gain control (to ensure your stored patches appear at the desired level), the selection is conservative, yet adequate for many organ and piano styles. The first effect on offer may be either pan, tremolo, auto‑wah, pedal‑wah or ring modulator. Of these, I didn't particularly care for either of the wah representations, but I've never been of the 'Funky Clav' persuasion. The ring modulator seemed a strange inclusion but turned out to be a lot of fun for 'weirding up' some of the Mellotrons and other samples. The second effect features phaser, flanger or chorus, the latter rather good and the others all basic, yet worthwhile. It's a shame there wasn't room for a delay, though; even one as rudimentary as the Nord Wave's would have been welcome. Next up is the Speaker/Amp emulation, which features various amp models and the rotary speaker effect that appeared in the C1 Combo Organ. It sounds superb — and has gained a new function, Rotary Stop Mode. This was implemented to mimic early single‑speed rotating speakers; you can switch between fast and stopped rotation using a button or a pedal connected to the Rotor input. It seems a tad illogical that the controls to enable the Leslie effect are embedded within the Speaker/Comp section but its speed buttons are placed elsewhere — with the organs. Often, my hand headed for the speed control before I remembered this and detoured to switch on the effect first. In common with other aspects of the Electro 3's sound, there are several user‑adjustable parameters; for example, speed and acceleration times for both treble and bass rotors. The reverb is as uncomplicated as they come, having just five types and a depth control. It's a fine‑sounding addition all the same; I've become particularly fond of the 'Hall Soft' algorithm, which is lush and warm whether used sparingly on a Hammond patch or in eerie abundance on a Mellotron flute. Our last stop is the three‑band equaliser, a 'fix all' tool to optimise your patches; its sweepable mid is ideal for de‑muddying some of the pianos, or for giving the organs even more presence. A well‑established breeding stock facilitates pedigree choices: organs from the C1 Combo, pianos from the Stage and samples from the Nord Wave. Due to a willingness to respond to reviews and user feedback, Clavia have continued to improve their original design, producing their best collection yet of classic instruments in convenient, modern form. The Nord Electro 3 is a mature, highly evolved, organ‑based keyboard capable of covering electric pianos, Clavinets, acoustic grands and any sample you care to feed it. Any sample can be replaced — either with alternatives from Clavia's library or with your own creations. These elements, combined with a fast‑action keyboard and onboard effects, earn the Electro 3 its place in an increasingly cross‑pollinated Nord range. 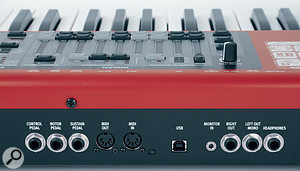 No Nord is considered to be a budget item, but at least the Electro 3 is cheaper and more portable than the keyboards it is intended to emulate. If you are looking for a single keyboard to deliver classic rock organs, pianos and lots more besides, the Nord Electro 3 comes highly recommended. If you're shopping for realistic organ performance in hardware, perhaps the closest match is Clavia's earlier model, the Nord Electro 2. Offering the Hammond and Leslie emulation we've admired here, the Electro 2 lacks the additional organ models, sample playback and effects, but it does feature a selection of electronic and acoustic pianos, although it's no longer a current product. An alternative in module form is the Sonic Core (formerly Creamware) B4000 tabletop. However, this little box of drawbars doesn't cover any of the extra options, such as pianos. Once upon a time, the Korg CX3 was the Hammond emulator to beat, and it still looks and sounds fab today. Not to be left out, Hammond's XK1 also concentrates on looking and performing like an organ, but grants panel space to a pitch bender and mod wheel in case it needs to double up as a controller keyboard. Few other keyboards encroach on Electro territory, but Roland's VK8, with samples such as pianos, strings and choir alongside its Hammond, has a go. However, the VK8 didn't cause a great stir when it first appeared, and unless you insist on physical drawbars and wood, I don't personally think it offers serious competition to the Nords. Loading replacement pianos or samples via USB is every bit as straightforward as it was on the Nord Wave, with one difference. 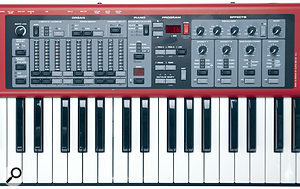 Instead of the Wave's Wave Manager, the Electro 3 requires two programs: the Nord Sound Manager and the Sample Manager. These will eventually replace all software for other Nords, and they're so new that they must be downloaded from Clavia's web site, along with an updated Electro 3 OS. The division of labour doesn't cause much hardship, although the supplied USB driver only permits one program at a time to communicate with the keyboard. Both are compatible with Windows XP, Vista and Mac OS X. The Sound Manager looks after patches, presets, samples and pianos, while the Sample Manager is concerned with importing and looping samples, mapping them across the keyboard and turning them into Nord Instruments (multisamples). Instruments created for the Nord Wave loaded fine and it was equally easy to build new ones from scratch based on any selection of WAV files that happened to be kicking around. Pianos and samples are user‑replaceable. Tweakable and versatile — and, above all, highly playable. Split keyboard only applies to organ models. No way to adjust keyboard velocity response. The Nord Electro 3 serves up superb organs and a choice collection of electric pianos, Clavinets, Mellotrons and other classics, in a slim and giggable form. Nord Electro 3 61-note version £1399; 73-note version £1599. Prices include VAT. Sound Technology +44 (0)1462 480000. Nord Electro 3 61 note version $2250, 73 note version $2499. American Music & Sound +1 800 994 4984.